This delightful small piece hangs in my kitchen. 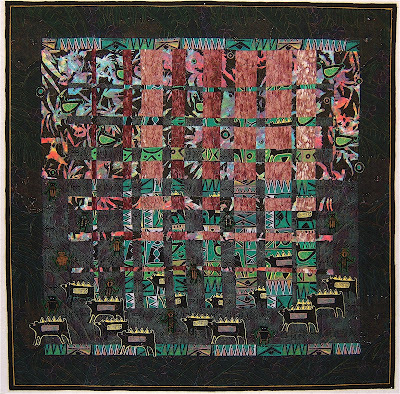 It won the blue ribbon for miniature quilts at the 2004 Dogwood Arts Quilt Show. It hung in a spot that called for a companion piece. So within the next year I made this one using the same collage technique. The pears and grapes are shaded with oil stick pastels. The white highlights are paint. The butterflies and flowers are also enhanced with pastels. 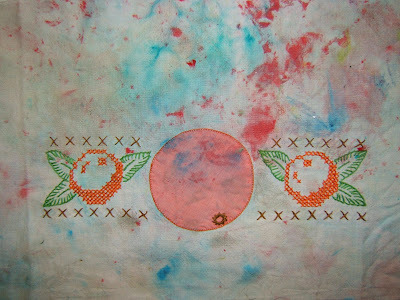 Both of those pieces had their beginnings as appliqued and embroidered dish towels belonging to my friend, Alicia. When they got worn and grundgy she used them as clean-up rags for her painting projects. When I made a fuss over them they became mine. Here's the last one she's passed onto me. This is where the pair of those miniature quilts hang. 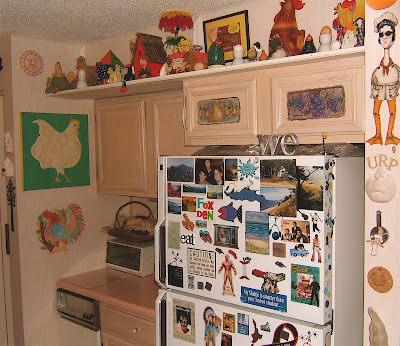 This area features a collection of chickens. I find it amusing that I really dislike real chickens, but I very much like chicken art. My negative feelings stem from living with and caring for and plucking those stupid birds on the farm in Iowa. 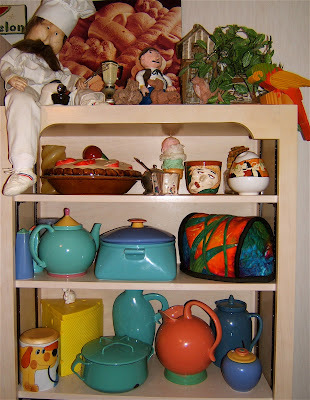 My Carol Bryer Fallet tea cozy lives in this cupboard. It covers the clear glass teapot. I'm especially fond of this cozy, comfortable corner in the kitchen. It's a nice place to enjoy a spot of tea with a friend. The first scrap quilt I made is hanging over the back of a chair. 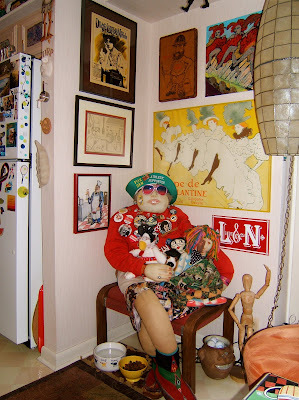 We have a permanent guest, Bertha Big Body, who occupies this corner of my cozy corner. The painting of the chef with the chicken was made by my husband when he was 11 1/2 years old. He did the wood burning of Toulouse Lautrec about 40 years ago. As you can see, our kitchen is full of art. 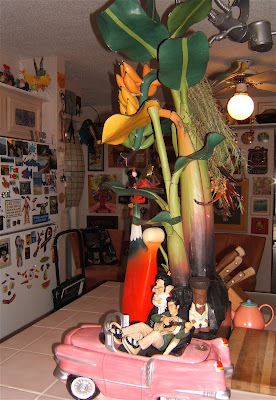 There's a 4' tall wooden banana tree standing in the middle of the island. Of course there's Elvis as well as one of my favorite chickens. Really, there is space to work and room to eat here. While the curved piece that I created in Caryl Bryer Fallert's workshop was hanging on my design wall I cut tulips and pinned borders to it. 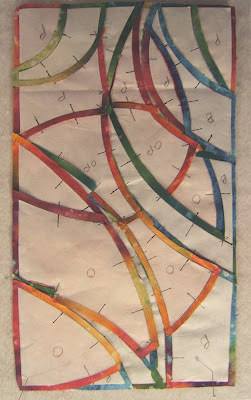 Then I layered a piece of Press'n Seal over it and drew a quilting pattern with a permanent Sharpie fine point pen. I then stuck the traced piece of Press'n Seal on a card board. I propped it up near my sewing machine so I could have a visual reference for free-form quilting. Don't know why, but I ran into all kinds of complications with the quilting ... thread breaking, tension problems, and just generally feeling clumsy about the whole process. While I was ripping out stitches I got to reconsidering the quilting pattern AND the whole project. 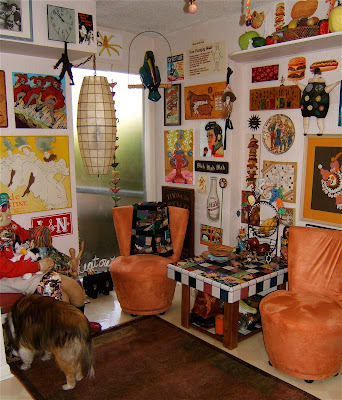 If I made a wall hanging there is no place to hang it. I would most likely donate it to my guild to raise money or gift it to a friend. 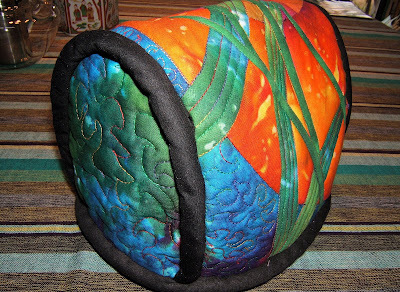 I really like this piece ... and I desperately need a tea cozy. 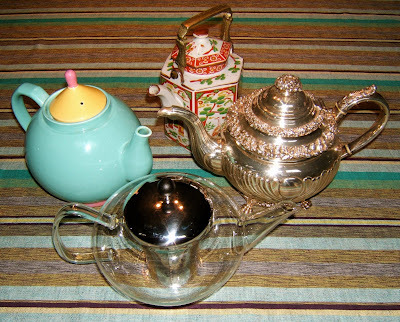 I have four wonderful tea pots and they get wrapped with a towel while my tea is steeping and to keep it hot. So.....I did a minimum of machine quilting after much fiddling with the tensions and drafted a pattern that would fit over my largest pot. Another factor that led me in this direction is that the "tulip" leaves are "growing" from top and bottom of this piece. That bothered me when I was thinking of it as a wall hanging. It works perfectly in this format. I finished constructing it twenty minutes before a friend came to have tea this afternoon. I'm delighted with my decision. I got "comfy with curves" in a wonderful day-long workshop with that title conducted by Caryl Bryer Fallert this last Monday. The morning was spent drawing/scribbling a variety of lines. Our first task was to recognize the type of gestural line that was unique to each of us. A smooth flowing arc kept appearing in most of mine. The next thing was to isolate parts that were personally appealing by moving a variety of small window openings cut into a sheet of paper over the drawings. Then the fun of adding and erasing lines to the selected section began. I came up with this design. The next step was to play with values by shading with a soft leaded pencil. 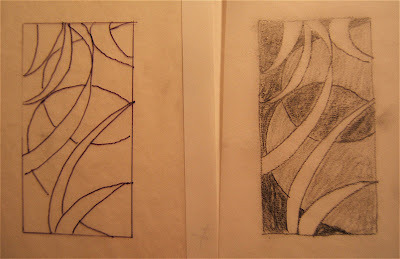 After doing this over three different tracings of my design I went with the one pictured above. Before lunch break we drew our design onto a transparent film. This was projected on the wall to the size of the finished piece. I determined the size of mine by the width of the freezer paper it was to be transferred to. Plus the fact that this was a one day class and I really wanted to get most of it done that afternoon. The afternoon was spent cutting, glueing, and sewing. But first we marked our paper pattern with orientation marks plus any other designations for value or color. 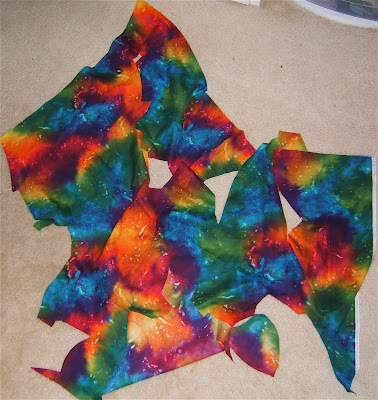 Even though I had taken a quite a selection of fabrics to class, I ended up purchasing and using a piece of Caryl's dyed fabric. I cut all the parts for this design from that one piece of fabric. The technique for sewing these graceful curves is called "applipiecing". It was fun ... like putting together a puzzle ... and it was easy to sew. The challenge was keeping track of all the parts. My next posting will show how this piece ended up. 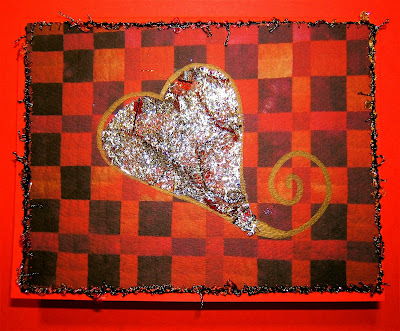 The Smoky Mountain Quilt Guild had a challenge to "make a playing card". The only card that I could even possibly think of making was the king. Elvis is the king of all suits. The members voted it to be their viewer's choice at last evenings meeting. There were sparkles of gold already in the musical note fabric as well as in the black one used for the symbols of the suits and around Elvis's portraits in the corners. The colored sparkles are from glitter glue applied with a paint brush. The center piece was originally black and white. 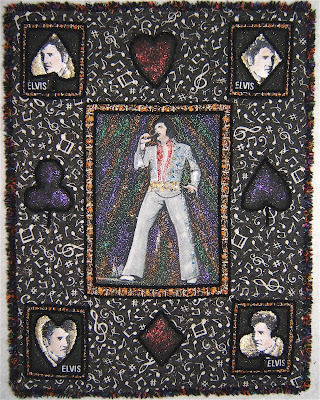 Elvis is colored with paint and oil stick pastels while the background is thread painted/quilted with the addition of the glitter glue. 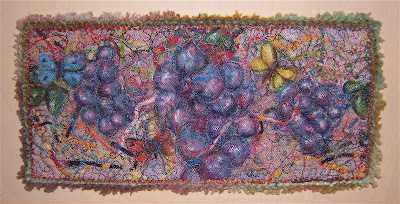 Black chenille yarn is couched around the symbols and frames, while a thick multi-colored yarn finishes the outside edge. 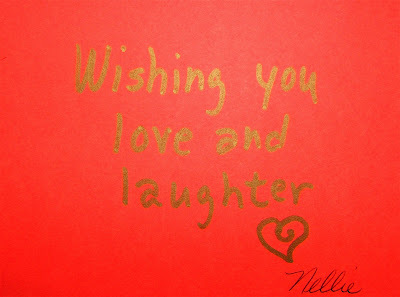 This will be given to my husband tomorrow ... Valentine's Day. 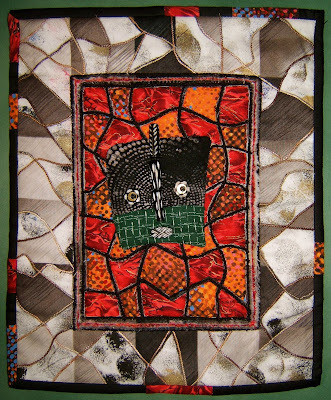 Another quilt from the African series. This piece began as just a demonstration to share Ricky Tims harmonic conversion technique. I selected interesting fabrics just to see where they would take me. I had no idea it would be into this fantasy jungle. The great aspect about this technique is that the strip sets can be combined any number of ways besides Ricky's prescribed formula. When I saw the tree trunks appear in this one I played with the arrangement to get the canopy of tree tops and a shadowed floor. 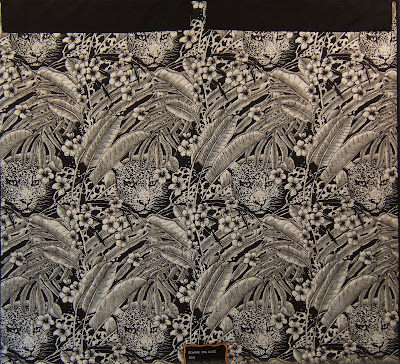 The large pieces of the fabric printed with animals ended up at the bottom. What little of that fabric was left got all the animals, birds, and circles cut out and hand-appliqued to the piece. I also added "natives" cut from a different fabric. 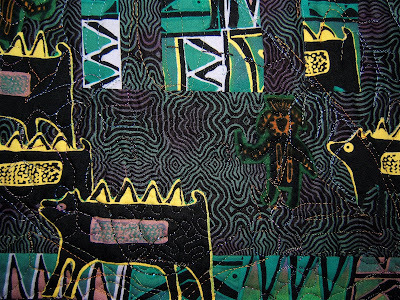 The green aura around those figures fit right into the green and purple print. If you look closely, you'll see the cats sneaking upon the beasts and the natives. Life is full of concealed and veiled surprises. This piece is machine-quilted following the printed pattern on the back. The decorative threads were wound on the bobbin. 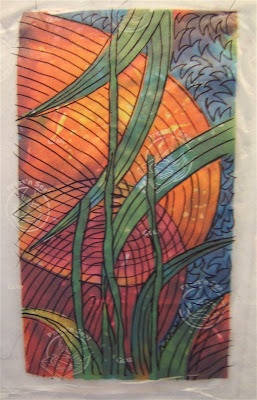 A variegated rayon thread is used for the flowers and fronds and a heavy multi-colored metalic for the cats. 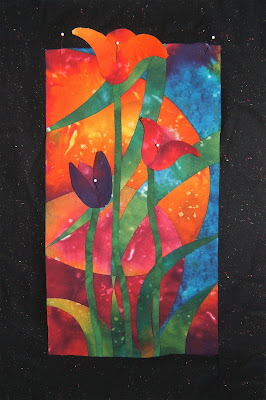 I added a hint of color to the flowers and fronds in the black border with oil stick pastels. Most of it is rubbed into (or off) and heat set into the fabric. Here is where my lady, "Waiting In New Orleans" hangs. I call it our wall of faces. There are a lot of other things displayed as well, but the majority contains faces either in a composition or a sculpture. One of the faces is my first African piece. It began as an experiment in David Walker's class at Arrowmont that year. Attaching a border to quilts made in his reverse applique technique is a challenge.I thought there had to be a way to construct the mat/border and center of a piece all in one step. 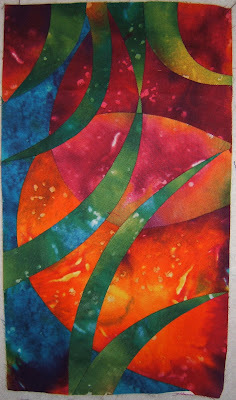 This piece has five layers ... two exposed in the border and two in the center plus a backing. 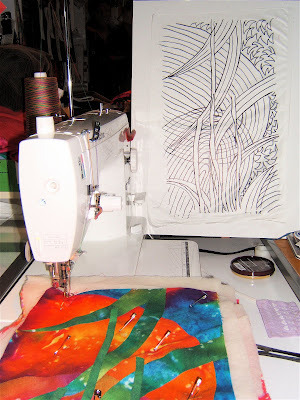 I drew the separate areas of the piece including the narrow inner border and the stitching lines on freezer paper. At this point each small section is designated a fabric role (as in fabric A is #1, fabric B is #2, etc. to #4.). The paper is ironed on the top layer and it's all pinned basted together. 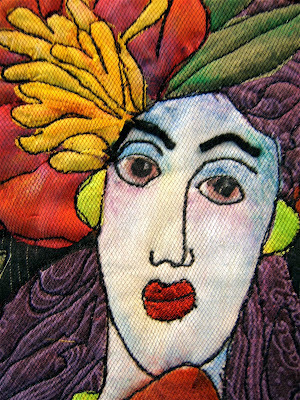 For this applique technique all the lines are machine top-stitched, then areas are cut away down to different levels to expose a desired fabric. The freezer paper is left in place until it's time to cut in that spot. Black chenille yarn is couched over the seams of the center section and on each side of the inner border. The inner border is one straight cut through the top three layers and then brushed to make fabric chenille. A tan variegated 6-ply floss is couched with a variegated thread over the seams in the border. 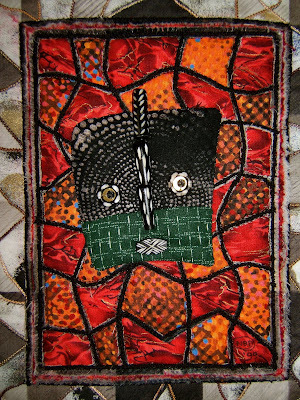 The mask is hand appliqued and decorated with beads and brass washers. The binding incorporates pieces that were trimmed away from the center. David's reverse applique technique in his work is amazing. Complex compositions are made much more easily than in any other way. At first, I felt "blind". There's no moving things around on a design board. I developed a great appreciation for, and trust in serendipity that week in March of 1999. Here is another "doll". She is the result of a challenge. Seven of us each brought a piece of fabric that we thought was interesting or difficult to use. There was a large scale print of green limes, a red machine-made lace, a smudged mis-printed piece, a primary color striped white fabric, a muted red-violet oriental wave print, and I contributed a hand-dyed red wool. We gave ourselves a year to think of a way to use these "somehow". There were no rules imposed. I chose to use mine all in one piece. She is not a "red hat" lady ... she's a bit too young. I based this piece on a painting I had seen in a Boulder, Colorado gallery. 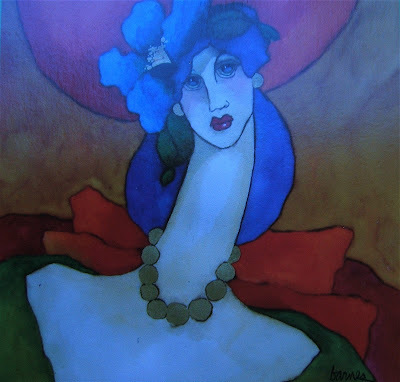 Tom Barnes features "long neck ladies" wearing huge red hats decorated with a single oversized blossom in a water color series. 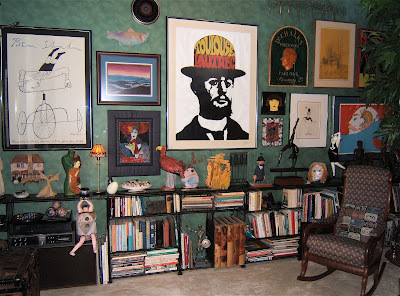 Here is a photo of one of his paintings from the gallery postcard. "Madam Ste. Ursule" - 32"x32"
I fell in love with his paintings, but certainly could not afford to buy one. I "played" with one for this challenge. There was a role for each of the fabrics ... plus. I chopped up several silk flowers to make the blossom. The background is a flanel with ikat-like white lines shot throughout. Her skin is unbleached muslin and her lips are a red silk brocade. I used oil stick pastels for shading her alabaster skin tone and the blossom. Even though the red wool was wonderful, I layered wool roving over it to give highlights and shadows to her hat and gloves. The roving was also used to soften and shade the fabric of her dress. Making a glass of wine that looked convincing amazed me. 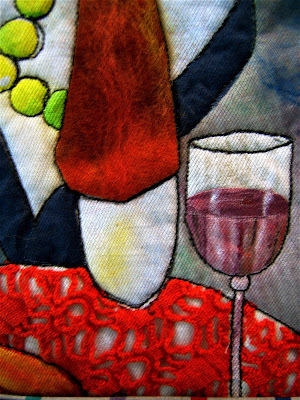 Oil stick pastel is used to give highlights to the glass and reflected colors in the wine. 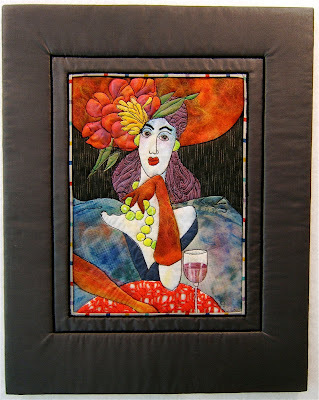 This is a fabric collage layered under black tulle. The black outlines are a straight stitch with a heavy thread. 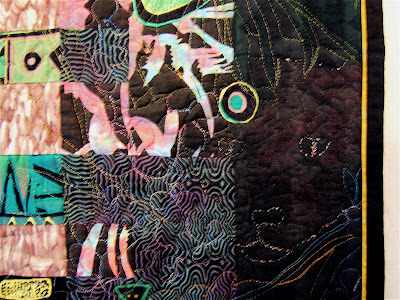 That stitching is also the quilting for this piece. I devised a unique framing technique for this wall quilt. A piece of foam core was cut. The inner opening of the foam core mat ends at the outer black line on the border. A thin batting was glued onto the front surface of the foam core with spray adhesive. The quilted piece was bordered in the usual way (note the primary striped white fabric was overpainted with a diluted black and forms the inner border around the piece). 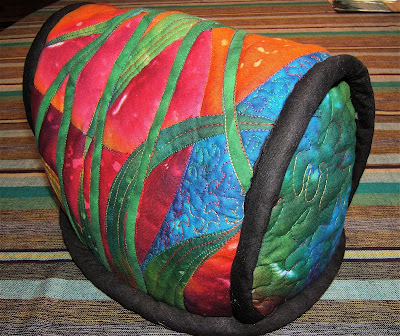 The backing fabric was sewn to the quilted and bordered front piece pillowcase style, leaving one end open. 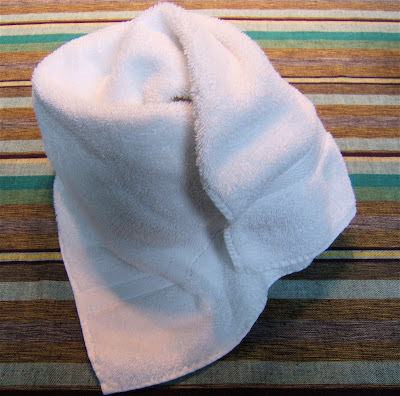 The foam core frame was slid inside and the open end slip-stitched shut. I carefully machine couched black chenile yarn at the inside edge of the foam core frame as well as between the striped and dark borders. If the piece were any larger, doing this machine stitching with the foam core inside the piece would be impossible because of the limited space in the harp area of the sewing machine. Here's a photo of the backside. The hanging device is hand sewn in place. You can see the zig-zag stitches of the two couched seams. This piece has a permanent hanging space in our living room. It hasn't been entered in any shows because it so closely resembles the painting even though the scale is much smaller and the medium is different. I made it for me.